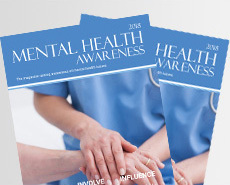 Why Advertise in Mental Health Awareness? Target your Local Market - advertising in MHA is an extremely effective way to promote your business or organisation within your desired marketplace. Our publications are widely distributed throughout all local hospitals – anywhere where patients, staff and visitors are likely to see them - waiting rooms, reception areas, visitor areas, outpatient departments and all other public areas. Cost Effective - obtain the benefits of a full year’s advertising for a competitive fixed price. Wide Market Distribution - MHA is continually distributed throughout the year reaching out to an estimated 100,000 local people annually. Supplies are replenished at regular intervals throughout the year and additional copies are circulated in the local area to doctors surgeries, local clinics and libraries. Our publications are also posted as E-books on our website in order to achieve even wider coverage. Support your local Mental Health Volunteer Groups - MHA publications operate a policy of supporting local mental health groups. Distributed Free – means more people read it because they do not have to pay. High Caring Factor – means people will perceive you as a company that cares about its’ community.